An experienced trial and appellate attorney, Jim Milton practices in the areas of commercial litigation, water law, and trust and estate litigation. He also serves on the firm's Board of Directors. Throughout his career he has focused on assisting clients with trust and estate litigation, including probate, will contests, guardianship and elder abuse. Within this practice, Jim regularly assists other attorneys in resolving complex probate, trust and guardianship disputes - whether as first of second chair litigator, strategy consultant, or resource for research and preparation of pleadings and legal arguments. Jim also provides compliance reviews in guardianship and probate matters, and assists in resolving complex real title issues in the fiduciary context. Additionally, Jim has developed a water law practice that includes defending developers and municipal utility authorities against claims asserted by rural water districts, as well as drafting wholesale water contracts. 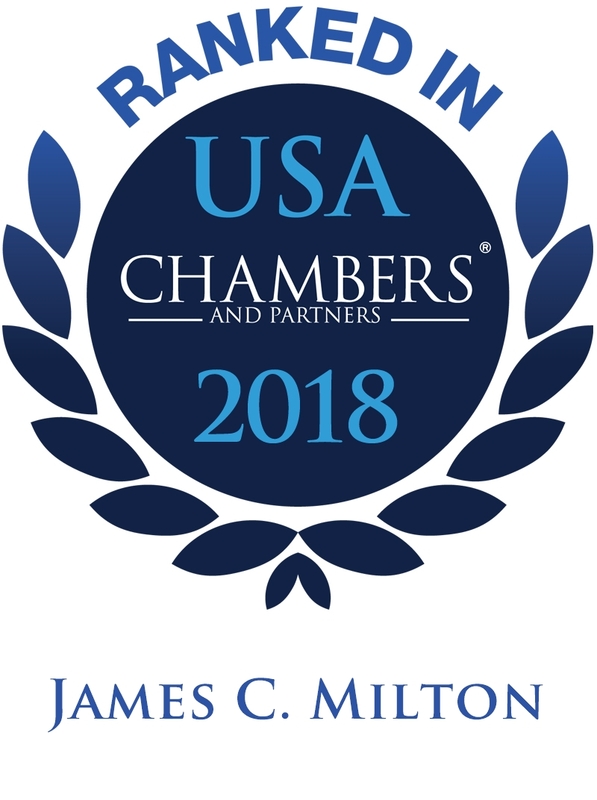 Jim has been recognized an Oklahoma Super Lawyer in Estate & Trust Litigation, as well as a Band 1 attorney by Chambers USA is General Commercial Litigation. He is also listed as a Best Lawyer in America in Commercial Litigation, Litigation-Municipal, Litigation-Trusts & Estates and Water Law, and has an individual AV peer review rating by Martindale Hubbell. Further, in 2009 he received a President's Award from the Tulsa County Bar Association's Continuing Legal Education Committee, and in 2011, he accepted the Oklahoma Bar Association Golden Gavel Award on behalf of the OBA Civil Procedure & Evidence Code Committee, which he has chaired since 2006. In addition, in 2006 Jim was named to The Journal Record's "Achievers Under 40" list and in 2009 to its "Leadership in Law" list, while in 2013 he was named to the Power Attorneys & Legal Professionals list by the Tulsa Business & Legal News. Finally, in 2018 he was recognized by the Tulsa County Bar Association with a President's Award. Member, Oklahoma Association of Municipal Attorneys, Inc. Served at program co-chair for the American College of Trust and Estate Counsel (ACTEC) “Heart of America Fellows Institute,” April 2018 (Oklahoma City). Served as panelist, moderator, speaker or organizer for more than 50 continuing education seminars on issues including estate planning, trust administration, water rights and creditor rights. Trust and Estate Attorney Jim Milton: Revisiting Pleading Standards? Jim Milton Authors Article, "Paying Trustee Attorney Fees from the Trust Estate"